· After fall of Rome (5th & 6th) century, drama languished in Europe. · From AD 400-900, almost no record of dramatic productions. · 10th century: church revives theatre by incorporating dialogues into Mass. 1. Mystery plays that dramatize stories from Bible. 2. Miracle plays based on lives of saints. 3. Morality plays that personify virtues and vices in allegorical stories. · The plays’ didactic content was gradually abandoned in favor of broad humor and worldly concerns. · By 16th Century religious drama was replaced by secular drama. · No longer supported by church, playwrights must find a way to make audience pays for entry. · Plays were changed to please the audience and keep them coming and paying. · Audience made from all classes so playwright included philosophy and poetry alongside violence and jokes. 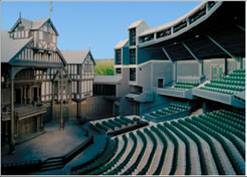 · Theatre accommodated around 25 hundred. · Rounded exterior with partly roofed yard in the center. · Interior walls had three galleries of seats sheltered from weather and rain. · In front of the stage was the pit which was less comfortable and cheaper as audience would stand to watch play. · Because of its structure, theatre provided intimate atmosphere as audience surrounded stage on three sides. · Stage was big enough to allow wide variety of actions like banquets and battles. · Setting not elaborately indicated by scenery or props and action was not interrupted from set changes. 2. soliloquy: speech delivered by actor alone on stage, revealing actor's state of mind. · Financial situation deteriorated when William was teenager. · He had limited education but was a learned man. · At 18, married 26 year old Anne Hathaway. · By the age of 21, Shakespeare had to support wife and three children. · By 1592 he was in London earning a living as actor and playwright. · He was connected with the Lord Chamberlain’s Men who built the famous Globe Theatre in 1599. · 1597, he was prosperous enough to buy a house called New Place in Stratford. · 1611, retired to New Place with his family. · On a street in Venice, Roderigo argues with Iago who he paid to help him win Desdemona. Roderigo has just heard Desdemona married Othello. · Iago shows contempt for Othello who just promoted Cassio over Iago as lieutenant. · Iago and Roderigo tell Brabantio that his daughter was abducted by Othello the Moor. · Meanwhile Othello is asked to attend at the Duke’s table. · Brabantio follows to accuse Othello in front of Duke, of witchcraft against his daughter. · Duke and senate take Othello’s side when they hear that it’s his war stories that won Desdemona, not his witchcraft. · Duke asks Othello to head to Cyprus to defend it against the Turks, Desdemona goes with him. · Cassio’s ship arrives, followed by Desdemona’s ship. · Waiting for Othello, Cassio clasps Desdemona’s hand. · Iago uses this incident to plant seeds of betrayal in Othello. · Iago gets Cassio drunk. Roderigo provokes him so they start fighting. · Governor attempts to hold Cassio down but Cassio stabs him. · Othello arrives, told by Iago of what happened, Cassio loses Othello’s favor. · Iago advices Cassio to seek Desdemona to gain Othello’s favor back. · Desdemona hears Cassio and sympathizes with him. · Iago asks his wife, Desdemona’s maid, to fetch him Desdemona’s handkerchief. · Iago uses Desdemona’s pleas in favor of Cassio to raise Othello’s suspicions. · Iago plants Desdemona’s handkerchief in Cassio’s room. · Finding her handkerchief in Cassio’s room, Othello consults with Iago who tells him he will kill Cassio. · Iago stabs Cassio, Othello hears his cry, assumes he killed him so he heads to kill Desdemona. · Othello smothers Desdemona in her bed, maid arrives, Desdemona cries murder then changes her story admitting suicide. · Maid tells Othello about handkerchief, he goes after Iago to kill him.